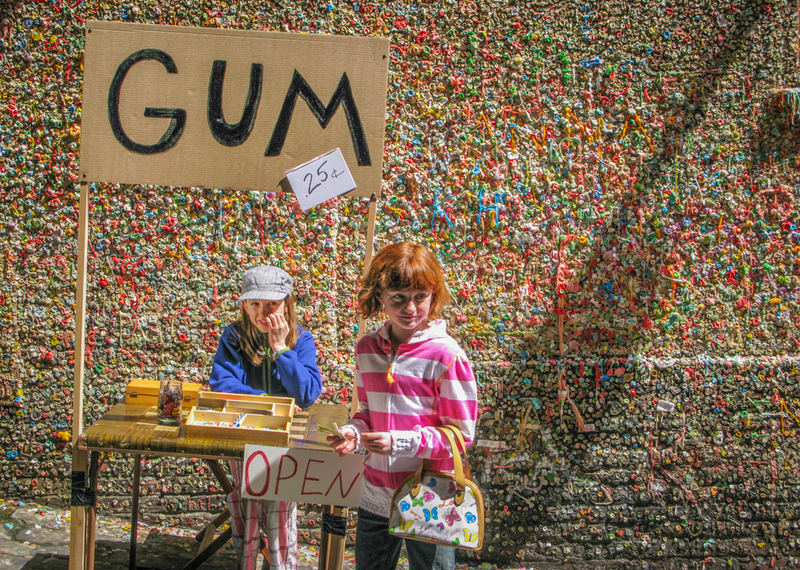 John Wiley Photography was established in the world famous Pike Place Market in 1985. We sell photographs of Seattle, the Pacific Northwest, and beyond. Mt. Rainier, and Seattles ferris wheel, at sunset. You can also see the football and baseball stadiums. Beautiful Seattle at twilight, 14,412 foot Mt Rainier shining in the distance. An amazing New Years sunrise, low beautifully sunlit fog gives Seattle and Mt. Rainier an otherworldly feeling. This was one of the most amazing experiences of my photographic career. 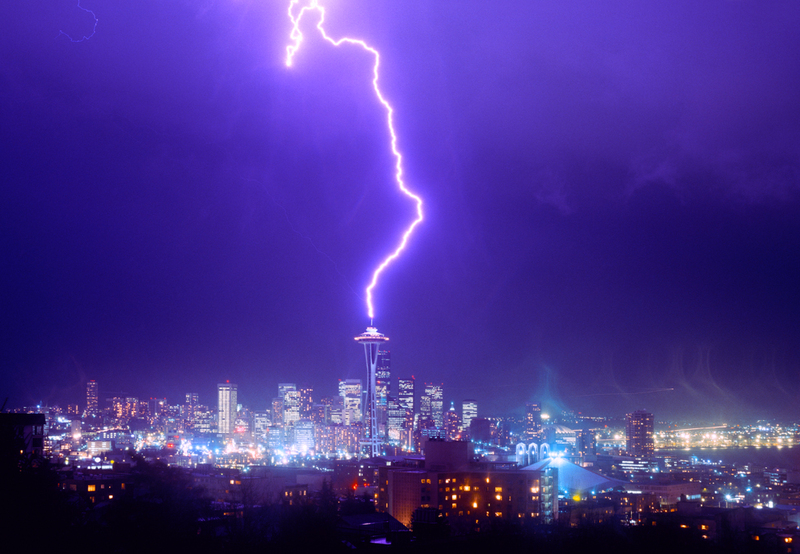 I was trying to get a photo of lightning anywhere over Seattle, and it hit the Space Needle! I ran up to Queen Anne Hill in a hail storm, and set up my trusty 4x5 Graflex camera, the hail stopped, and it got super calm. I started my long exposure, and remember saying " come on" to the storm, a minute or so later flash kaboom, and me jumping up and down. Seattles Best Coffee neon sign at the Pike Place Market at sunset. The iconic Pike Place Market clock sign. Photographed on a summer morning with dahlias and sunflowers, as the ferry comes in in the background. A summer morning with sunflowers, and the ferry. This photo is made from about 100 4x6 inch photos taken over the coarse of a week from several perspectives. I then hand-collaged them together to create a unique view of Post-Alley in the Pike Place Market. To see fish look at water. This Koi was photographed in Seattle's Arboretum, in the Japanese garden. I photographed a number of these Pear Tree leaves this fall. They are from a tree in my backyard which I pass on the way to my studio. Sometimes when you really pay attention, the simple becomes sublime. 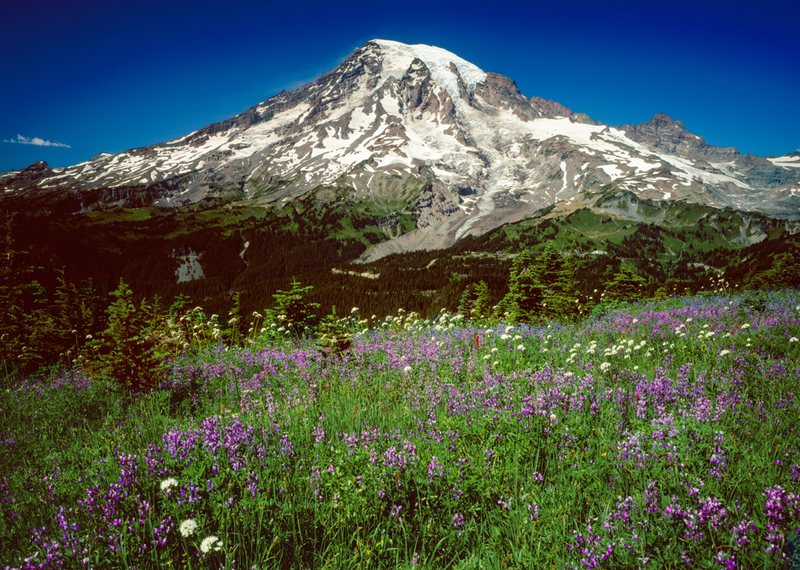 A beautiful early summer day in the Tatoosh range. Avalanche Lilies announce summer has arrived. Fresh Avalanche Lilies and Mt Rainier.